Every year during autumn I pay a visit to the beautiful Japanese Garden in Portland, Oregon and this year was no exception. My wife Lisa and I arrived to find the garden at the height of fall color and got in line with the other 20+ photographers waiting for the front gate to open at 8am. Because I have photographed the garden many times before and images captured here are some of my most successful fine art images, I set out to create images different from those I had created and seen in the past. The tree you see here is not “the” famous Japanese maple that you may have seen images of previously, but a smaller yet equally beautiful tree located on a hillside in the back of the garden. When I saw the leaves that were scattering the ground around the tree I knew I wanted to incorporate them into my image in a way that would evoke emotion without competing with the tree itself. I dropped the legs of my RRS TVC-23 Versa all the way to the ground and rotated my camera vertically using my BH-40 LR ballhead & L-plate combo allowing my camera to rest just a few inches above the ground. I chose an aperture of f/2.8 and manually focused on the center of the tree and took the shot. Knowing that this approach may leave the tree itself a bit soft, I also took a second image at f/16 and during post I blended in the top 1/3 of the f/16 frame with the f/2.8 frame to create the image you see here. The fog in the background created just enough contrast to achieve the mood I had hoped for. 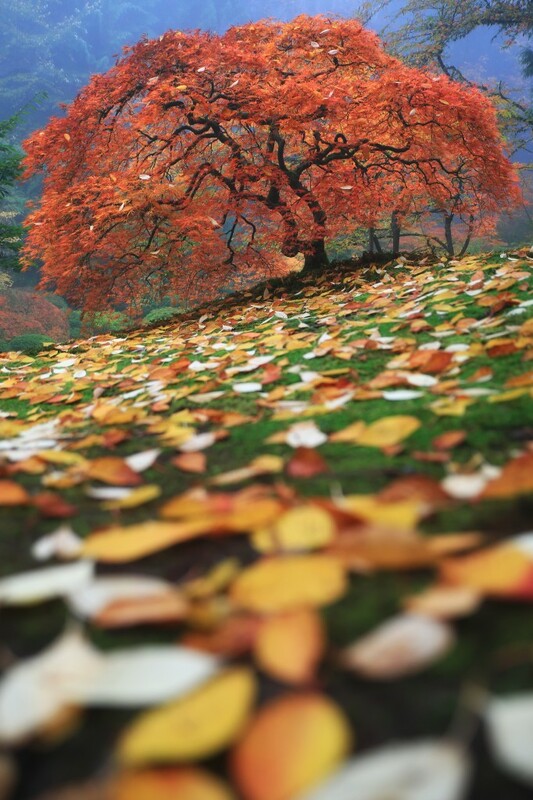 Aaron Reed is a fine art photographer based in the Pacific Northwest. Copyright ©2013 Aaron Reed. All rights reserved. That’s an amazing composition, using two depth of fields like that! Really nice blend and love the colors all the way. Aaron, I’m glad our gear played a role in creating this beautiful image. Blending shots can be a challenge, but you have pulled it off nicely. Joe Sr. This place and this picture are really magnificent !! However I would have given a little more space above the tree, if possible and if there was no disturbing elements, doing a cut on a little part of the nearest ground. In other words I would have tilted down the camera a little less and framed a little more up, around the area of this cold atmosphere on the far hill. Would give greater color contrast, blue against yellow, orange, red, but also, and above all, more breath to the image.